How to minimise enlarged pores? Having large pores and blackheads has been an insecurity of mine for quite some time. In general they are actually two of the most stubborn and hard-to-treat skincare problems, very common to all of us with oily or combination skin. The problems arise when the oil glands produce too much oil and mix with other substances, consequently causing a clog. This clog makes it difficult for the oil to flow freely, which causes the pore itself to enlarge. Pores are, to put it simply, very tough, almost impossible to eliminate completely. Enlarged open pores on face can make your skin look aged and unhealthy. So to achieve the best results possible, you need to know exactly what works for your skin and what doesn't. That's why I made quite a thorough online research and now I'll share my tips and tricks, if you are dealing with the same problems as I do. If you are using the right products consistently you will definitely see an improvement! But remember, you can't make your pores completely disappear, but you can make them appear smaller. So what can you do? Check out the tips below. 1. Avoid using skincare products that clog pores or cause your oil glands to produce more oil. You must avoid products with thick and creamy texture (which most moisturizers for dry skin have), because they will lead to clogged pores. Be especially careful about the moisturisers you use - you need an oil-free moisturiser that will balance the skin's natural levels and mattify your complexion. I personally enjoy using water-based moisturisers and serums, because they are very lightweight and not greasy on the skin. 2. Use gentle products. You need to be especially careful about the cleansers (try to avoid bar soaps). That way you will avoid products with drying, irritating ingredients, which stimulate more oil production. 3. Have regular facials. Trust the experts, because they know what they are doing. They can extract blackheads and reduce the pores without damaging your skin. 5. Clay Masks are one of the best natural remedies for enlarged pores. Clay masks can be used for absorbing excess oils and are great options for treating large pores. 6. Exfoliating and Cleansing. One of the fastest ways to shrink large pores is by proper cleansing and exfoliating. To reduce the size of your existing enlarged pores, you need to exfoliate your skin consistently. But remember that washing your face is a short-term solution. It stops your pores from having to expand to hold extra oil or other buildup from the day. 7. This next tip is my favourite treatment that I found on the Natural Beauty Tips website. "Lemon Juice, Cucumber Juice And Rose Water To Tighten Skin Pores: One of the best natural remedies to reduce large pores is applying lemon juice. Lemon juice contains natural enzymes that can firm up and tighten the facial skin. Its acidic characteristic also cleanses deep skin impurities, while vitamin C helps in lightening the skin. For minimizing large skin pores naturally, mix 1 tablespoon of lemon juice with 1 cup of rose water and 1/2 cup of cucumber juice. Stir all the ingredients together thoroughly and apply on the skin area having enlarged pores to cleanse, lighten the skin and for shrinking pores as well." 8. Wear Sunscreen. The sun can make your skin less supple, aged and very dull-looking, consequently making your pores appear bigger. 9. Use blotting paper on your oily areas throughout the day to keep all the oils under control. 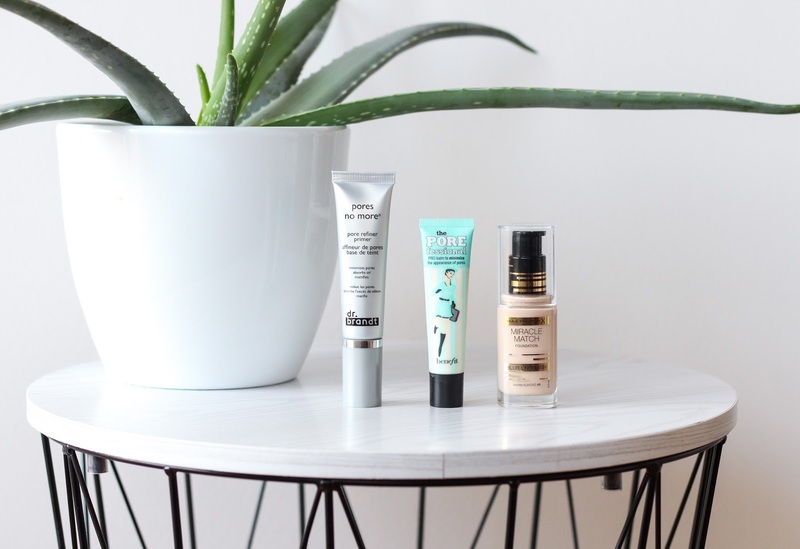 I also decided to include some of my favourite products in this post. Benefit The Porefessional was my favourite primer for a very long time, because it completely fills in my enlarged pores and makes my complexion appear completely poreless. But it sadly makes me very oily in my T-zone that's why I stopped using it and switched to another great primer - Dr. Brandt Pore No More Refiner Primer. It does the same amazing job as Benefit Porefessional in filling in my pores, but it doesn't make me oily at all. This is my wonder (and very expensive!) product, honestly worth every penny. You also need only a tiny bit to achieve great results. I would highly recommend you to try it out yourself! If you are looking for a more affordable drugstore option I would recommend the Maybelline Baby Skin Pore Eraser. Although this is not as good it still works pretty well. It's a good affordable alternative. I also heard that Benefit is coming up with another version of the Porefessional, this time in a matte version, which I'm very excited to try out. I'll let you know my thoughts on it as soon as it launches, so keep an eye out for that. I also tried a new MaxFactor Miracle Match foundation in 45 Warm Almond, which claims that it blurs and nourishes the complexion. Even though it doesn't completely fill in the pores, it creates a lovely allusion of a blurred complexion. The only drawback to this foundation (and the brand in general) is the colour selection - all of the shades are very neutral to cool toned, which contrast my NC20, warm toned complexion. Sadly this foundation is way too pink for me. Other foundations that I love using are Jouer Matte Moisture Tint, Clinique Even Better Makeup and Mac Face and Body. I've been wanting to try out that Benefit primer! Love your as well, keep it up, xo.